2016 nest box surveys – what’s a Tuan? Tuan covering body with tail. Connecting Country undertook its biennial nest-box monitoring surveys in autumn 2016. The very exciting news is that the target of this program, the threatened marsupial known variously as the Brush-tailed Phascogale and the Tuan, significantly increased its occurrence compared to the 2012 and 2014 surveys. In all previous surveys, we had monitored only a sample of the 450 nest boxes located across 150 sites. This year, we managed to visit all of them (bar one site). Many boxes had not been checked since they were installed back in 2010. Most boxes remain in very good condition. Landholder interest in the boxes and their contents was very high. There are Tuan scattered across all parts of the shire and immediate surrounds. In particular, they considerably in increased in occurrence in the north-east where there had been few previous records. 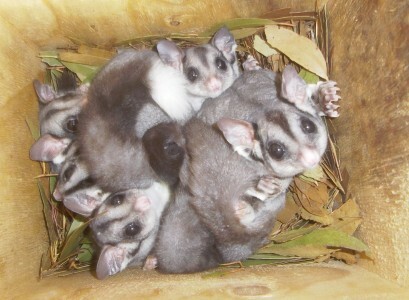 Sugar Gliders remained the most abundant species, with evidence of their occurrence at more than 80% of sites. Colonisation of the nest boxes by feral honeybees was low again (15 boxes or 3% of the total). As we’ll describe in another blog soon, we have been working with a local apiarist to move the bees out of our boxes and into carefully managed hives in urban settings. The boxes can then be reused for tuans and gliders. A more detailed report on our findings is available for download (CLICK HERE). A copy of this report is provided to each landholder, as well as a more detailed report on the findings from the boxes on their particular property. We are so very appreciative of all of the landholders that have taken on the responsibility of having boxes on their properties, and for allowing us to return to check them every year or so. 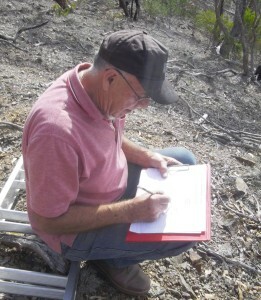 Volunteer helping with data collection. La Trobe university PhD student Jess Lawton also undertook a complementary study on tuans at a sample of the nest box sites. She temporarily installed wildlife surveillance cameras at these locations, and also collected extensive habitat data. Her results are not yet available, but she has produced a short video compiled from the wildlife recordings made at one particular nest box location near Axe Creek. The link to this video is provided here if you are interested (https://www.youtube.com/watch?v=VTklMGskLyY). We’ll prepare another blog about Jess’s findings soon. It was a great experience having her work with us and local landholders. CC staff members (Chris, Asha and Max) are also incredible grateful to all of the volunteers that supported us in various ways through the intense nest box monitoring period (Brandie, Brent, Damian, Daniele, Eva, Fritz, Greg, Hannah, Jan, Jane, Jeremy, Josie, Kerrie, Lisa, Mal, Naomi, Phil, Sean, Thea, Tim, numerous landholders, and the Maldon Urban Landcare groups. Apologies to anyone that we have forgotten – there were a lot to remember!). 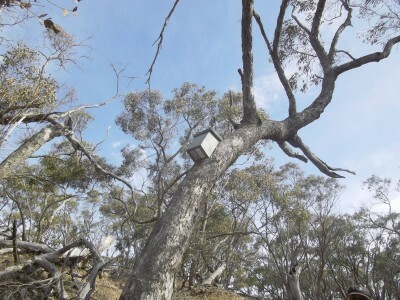 Typical nest box in a tree. 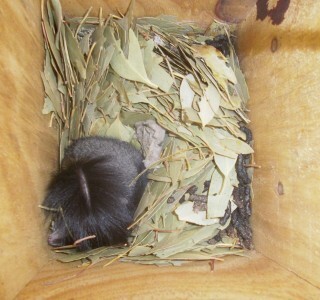 I have a tuan in a nesting box on my property at Moonlight Flat. The nesting box was there when I bought the property. It has been home to honey bees, crimson rosellas and now a tuan (or possibly more) in the last three years.